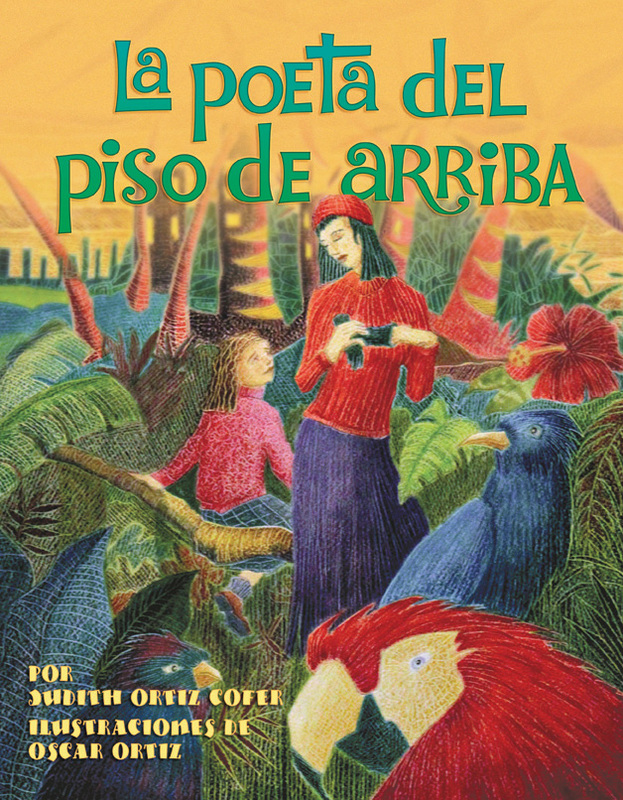 Originally published as The Poet Upstairs, this award-winning ode to poetry is now available in a Spanish-language edition. Juliana is too sick to go to school one cold, winter day. So she stays in bed and looks out her bedroom window. She watches as a tall lady in a red coat and hat carries her boxes of books and papers upstairs. Her mother has heard that the mysterious woman is a poet writing a book. Juliana loves books and can’t wait to meet the poet upstairs. Juliana listens to the poet’s typewriter clicking and clacking all day long, while outside the snow falls and people rush by bundled up in their coats. She dreams of the tiny tropical island “sitting on the ocean like a green button on a blue dress,” the island home that her mother and the poet share. She dreams of red hibiscus flowers and beaches of white sand. The next day, she receives an invitation from the poet to come upstairs. Together, they write a poem about a big river that leads to the sea. As they make pictures with words, the walls of the cold apartment become a beautiful vista of mountains, palm trees, birds and flowers. That special day, poetry takes Juliana from her cold and ordinary apartment to a sparkling island habitat. Invoking Puerto Rican poet Julia de Burgos’ famous poem about the Loiza River, Ortiz Cofer’s lyrical text is combined with Oscar Ortiz’s breathtaking illustrations of the natural world and the animals that inhabit it. This inspiring picture book for children ages 5-9 demonstrates the power of the written word as Juliana learns that poetry can change the world. JUDITH ORTIZ COFER, the Regents’ and Franklin Professor of English and Creative Writing at the University of Georgia, is an award-winning poet, novelist and prose writer whose work deals with her bilingual, bicultural experience as a Puerto Rican woman living on the Mainland. She is the author of numerous books, including Silent Dancing: A Partial Remembrance of a Puerto Rican Childhood (Piñata Books, 1991), included in The New York Public Library’s 1991 Books For The Teen Age and recipient of a PEN citation, Martha Albrand Award for non-fiction, and a Pushcart Prize; and An Island Like You (Orchard Books, 1999), recipient of the Pura Belpré Award and named an ALA Best Book for Young Adults, a School Library Journal Best Book of the Year, and an ALA Quick Picks for Reluctant Young Adult Readers. Other books for young adults include If I Could Fly (Farrar, Straus and Giroux, 2011), Call Me María (Orchard Books, 2004) and The Meaning of Consuelo (Farrar, Straus and Giroux, 2003). OSCAR ORTIZ was born in Manhattan, New York, USA in 1964. He started painting and selling his pieces back in 2002. Eventually he moved into selling prints and licensing his art all over the world, represented in part by Bridgeman Art Library and similar venues. Oscar’s paintings have graced calendars, CDs, magazines, posters and others. Organizations, like UNESCO, have used his images for several purposes. Among his most recent projects are: illustrating an award winning children book, The Poet Upstairs, by Judith Ortiz Cofer, published by Arte Público and released on November 30th, 2012. He also illustrated a text book for National Geographic Learning. Each day, he drinks fresh brewed black coffee at 3 PM so as to stay rooted to his Puerto Rican upbringing. He is still dating his high school sweetheart after 28 years of marriage.